St Augustine of Hippo (353 -430) was one of the most important early Christian writers. Among his many books, his commentary on the psalms was one of the most widely copied and quoted during the middle ages. Augustine wrote a separate commentary on each psalm, some of which are lengthy, all together making for a very long book. Often manuscripts of it were bound as two or three volumes--as are modern printed editions. This manuscript is Volume One of a copy that belonged to Rochester cathedral priory. It probably served multiple purposes: for reading from during the daily prayer services (divine office), as a source when composing sermons, for theological study and personal contemplation. Although the commentary on Psalm 1 begins with a richly decorated first letter, most of the commentaries have large but modestly decorated initials. 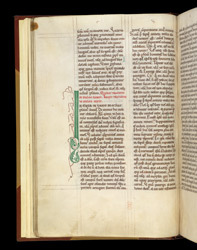 On this page, the red writing (rubric) signals the reader that the commentary on Psalm 5 has ended and that on Psalm 6 begins. While the decoration is modest, the pages are well organised, alerting the reader to the structure of the text. Around the letter, lines of metalpoint (pencil) drawing can still be seen.